SET A IS MADE UP OF A TWO COLUMN TROPHY FOR THE 1ST PLACE SIZE MEASURING 22 INCHES TALL, 2ND PLACE MEASURES 15 INCHES TALL AND IS A SINGLE COLUMN TROPHY, 3RD PLACE IS 14 INCHES TALL. 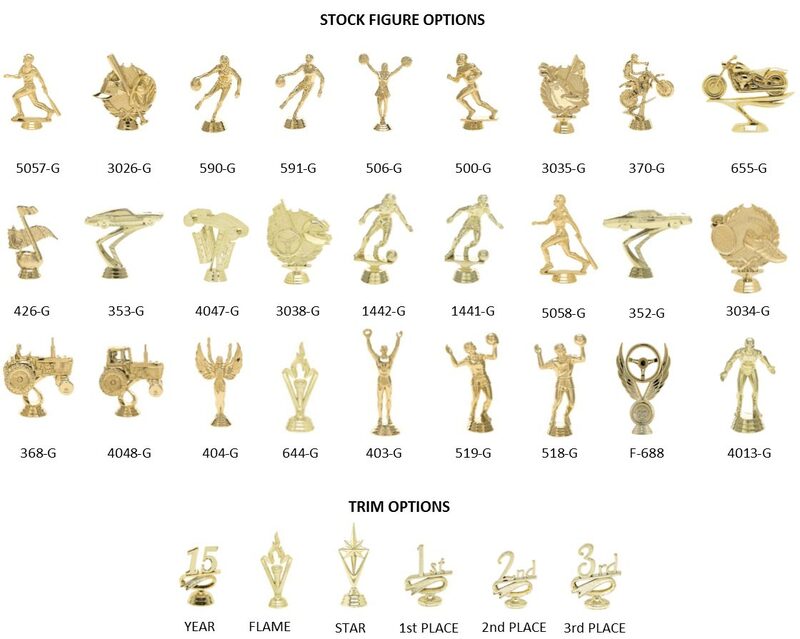 (ALL MEASUREMENTS ARE BASED ON A FIGURE HEIGHT OF 5 INCHES) ALL OF THE TROPHIES IN THIS SET HAVE A FLAME STAND TO MAKE THE TROPHY POP AND TO GIVE IT A COOL FUN LOOK. THIS TROPHY SET COMES WITH FREE ENGRAVING AND IS AVAILABLE AS A KIT OR PARTIALLY ASSEMBLED OPTION. YOU WON’T BE DISAPPOINTED WITH THIS TROPHY SET FOR ANY KIND OF EVENT. KIDS LOVE THEM TOO!! Click the button below to add the SET A to your wish list.